^ The Pragmatic Programmer: From Journeyman to Master. Addison Wesley. ISBN 978-0201616224. p. 95, footnote. ^ Baker, SJ, The Contribution of the Cardboard Cutout Dog to Software Reliability and Maintainability . 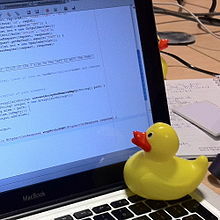 ^ Stack Exchange has been taken over by a rubber duck!. Meta Stack Exchange. 2018-03-31 [2018-04-01] （英语）. ^ Purushothaman, Praveen Kumar. Quack Overflow - Stack Overflow's take on April Fool!. Adventures (Blog). 2018-03-31 [2018-04-01] （英语）.